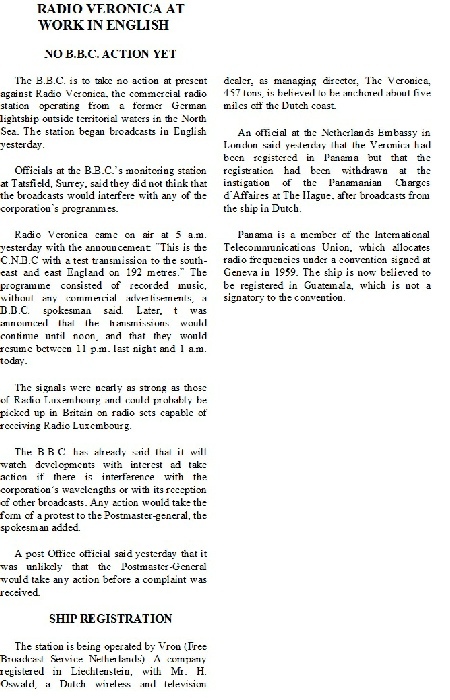 Towards the end of January and in February 1961 test transmissions took place from Radio Veronica’s ship, Borkum Riff for an English language service - known as CNBC (Commercial Neutral Broadcasting Company). 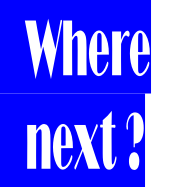 This company, which had been established by the Verweij brothers using their personal financial resources to try and break into the potentially lucrative English market. CNBC effectively hired airtime and landbased studio facilities from Radio Veronica and appointed a British agent who operated from offices in London. The first test transmissions for CNBC took place in November/December 1960 with non-stop music and the occasional announcement in English. On 16th February 1961 two hours of test broadcasts from CNBC started again at 5.00am, but after a few days CNBC's on-air time changed to 8.00am - 1.00pm and broadcasts under this call-sign continued for some weeks. 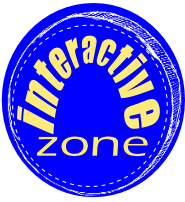 It was planned that when the station came on the air with regular programmes it would broadcast for a total of nine hours a day. However, because of Radio Veronica's low power transmitter, reception of the CNBC signal in England was weak and mainly confined to areas along the east and south east coasts, with the important commercial target area of London not being reached. Because of this, together with the increasing popularity of Radio Veronica itself in Holland and demand from Dutch advertisers for more airtime, CNBC broadcasts were discontinued on 22nd March 1961. 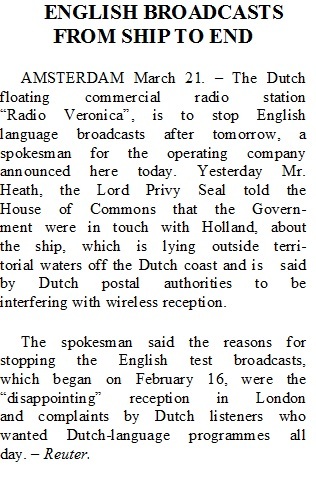 The hours allocated to the English language station could now be more profitably filled by Radio Veronica's Dutch programming and advertising. CNBC, although only short-lived as a radio station and never really progressing beyond the test transmission stage, did have the distinction of being the first offshore radio station whose programmes were directed at a British audience.